K.I.T. Group Headquarters and K.I.T. Group Greater China joined forces in organising their first study mission to Hong Kong from June 6 to 9, 2018. Supported by the Hong Kong Tourism Board (HKTB) and Meetings & Exhibitions Hong Kong (MEHK), this gathering brought together leaders from eight international associations and local partners to discover the East-meets-West culture, to exchange business ideas and to learn about the latest MICE and economic developments in Hong Kong. On K.I.T. 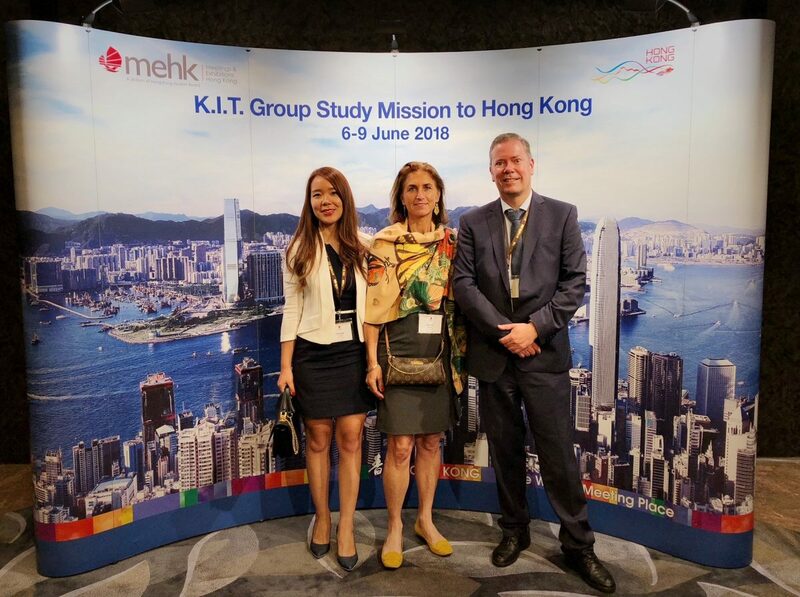 Group’s Study Mission to Hong Kong, K.I.T. Group Managing Director Jocelyne Mülli introduced K.I.T. Group to the participants. In her talk titled “Global, Local: The World Is Our Office”, Jocelyne Mülli spoke on how K.I.T. Group has been attracting international association business to China and provided some tips for success from the perspective of an international PCO. Under the title “How To Boost Attendance From Asia to Participate in International Conferences?” this talk was followed by a presentation about the Chinese social media, messaging and payment app WeChat, jointly given by K.I.T. Group’s WeChat partner Thomas and Chunjing Yang, Deputy General Manager of K.I.T. Group Greater China. Both talks were well received by delegates, as they presented new ideas for innovative international conferences in China.